This month’s newsletter contains announcements of two new publications from UNU-IAS and other IPSI partners: the latest volume of the Satoyama Initiative Thematic Review, and a report on the development of the GIAHS programme in Asia. We are also pleased to share the announcement of nominations for the 2018 MIDORI Prize for Biodiversity, and a write-up of one of IPSI’s most recent case studies. We hope all of our readers will find this useful. A new volume of the Satoyama Initiative Thematic Review (vol. 3) with the theme: “Sustainable livelihoods in socio-ecological production landscapes and seascapes” was recently published jointly by UNU-IAS and IGES. The volume compiles 11 selected case studies provided by authors belonging to IPSI member organizations and covers experiences from countries in Asia, Europe, Africa and North America, with various socio-political and ecosystem contexts. Authors were asked to identify challenges and opportunities in sustaining livelihoods, social and ecological changes that have occurred and approaches being deployed to strengthen natural and social resilience in the landscapes and seascapes where they work. In addition, the volume includes a synthesis chapter that summarizes the findings of the case studies and provides overarching principles for mainstreaming for policy makers and practitioners working on the ground. IPSI member the United Nations University Institute for the Advanced Study of Sustainability Operating Unit Ishikawa/Kanazawa (UNU-IAS OUIK) recently published a report titled “The Road to Globally Important Agricultural Heritage Systems (GIAHS): United Nations University’s Journey with Local Communities”, which details UNU’s involvement in expanding GIAHS in Asia. GIAHS is an initiative administered by the Food and Agriculture Organization of the United Nations (FAO) for identification and conservation of agricultural systems around the world that, according to its website, “have resulted not only in outstanding landscapes, maintenance and adaptation of globally significant agricultural biodiversity, indigenous knowledge systems and resilient ecosystems, but also food and livelihood security for millions of poor and small farmers in a sustainable manner”. UNU has actively promoted the GIAHS concept in Japan since 2009. 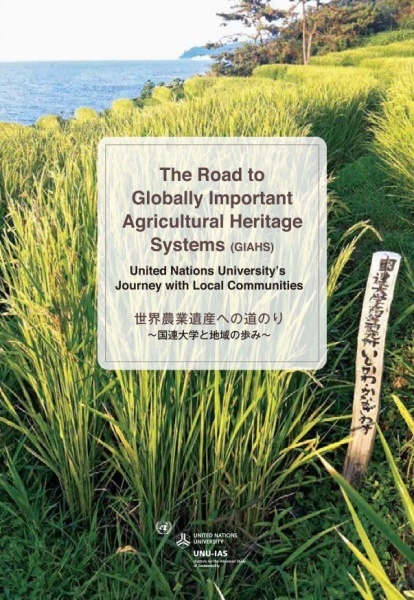 This publication documents UNU’s work with local communities and various stakeholders in Asia thus far on the road to GIAHS designation and the roles of the GIAHS sites in conserving their agricultural heritage systems. This publication should be of interest to many IPSI members, particularly governments and government-related organizations in any countries that are interested in introducing GIAHS or expanding its presence. The publication is available for download from UNU Collections here. The IPSI Secretariat recently received a notification that nominations are now open for the 2018 MIDORI Prize for Biodiversity. The MIDORI Prize is an international prize co-organized by the AEON Environmental Foundation and the Secretariat of the Convention on Biological Diversity, which honors three individuals who have made outstanding contributions to the conservation and sustainable use of biodiversity. We encourage you to consider nominating any IPSI members or related people from your networks. The call for nominations remains open until 15 June 2018. More information can be found, including nomination instructions and forms, at the AEON Environmental Foundation website here. The IPSI Secretariat recently received a case study from partner organization the United Nations’ Centre for Alleviation of Poverty through Sustainable Agriculture (CAPSA), a subsidiary body of the Economic and Social Commission for Asia and the Pacific (ESCAP), based in Bogor, Indonesia. The case study is titled “Cultural-Based Policy for Sustainable Landscape in Kasepuhan Ciptagelar”. Climate change is a risk for Indonesian farmers in deciding plantation timelines and avoiding crop failures. Additionally, Indonesia relies on rice as a staple food, requiring more sustainable landscapes and irrigated rice systems. Rice remains a priority of food crops development in Indonesia, particularly to reduce its import dependency. Many indigenous people in the country consider rice as a symbol of life, for instance, rice is a gift from the god for the natives in Ciptagelar, West Java. Farming practices in Ciptagelar follow ancestral principles. They implement non-intensive agriculture where the planting cycle only takes place once a year for six months duration. The customary laws do not allow rice trading, letting the natives depend economically on other agricultural commodities. They live in simplicity, protecting the environment as they have a high appreciation towards the land and totally obey the customary law. Restriction of cultivable area, strict rules in utilizing woods and exact planting periods are some examples of cultural-based policy leading Ciptagelar to social, economic and environmental sustainability.